Share a Thanksgiving recipe you will be cooking up this month. I'm a pretty good, albeit frequently disinterested, cook. Sometimes, I just don't think I have it in me to cook one.more.meal. Yet, there are times when I really put my chef on and Thanksgiving is one of those times. I make a mean Thanksgiving dinner--I think I inherited this from my mother who made hundreds of holiday meals. Sometimes she'd make more than one large meal for one holiday. I remember a time where she made 3 Christmas dinners over two days (a Christmas Eve lunch, a Christmas Eve dinner, and then a Christmas dinner) so that everyone could fit a home-cooked meal into their schedules. I am not that crazy. If you don't make it to my Thanksgiving dinner then you are just plain out of luck. I haven't yet settled on all the details for this year's dinner, but here are a few guarantees. I will include links to recipes where I can and please excuse my liberal use of the Food Network. First off, the bird. This year, I'll be using a this recipe from Anne Burrell. I used another one of her recipes last year--it looks like it was the same technique, but a different flavor profile--and it was quite tasty. I'm a believer in brining but, folks, there is no way I can brine a bird in my fridge. Instead, I've developed an method using a Coleman and ice bags. I know, high tech. 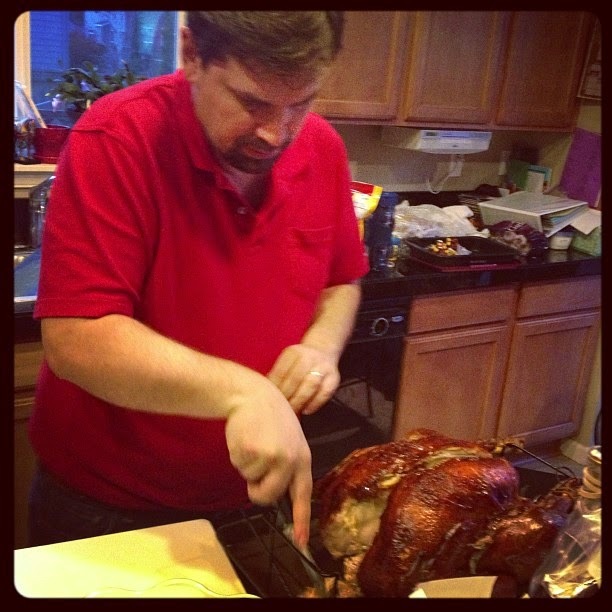 My dressing recipe (I don't do stuffing because I'm not a fan or salmonella) is also from Food Network. I don't even know who these guys are--I certainly haven't seen their show--but the recipe is excellent. And it can be made a day or two in advance and then just popped into the oven after the bird is out. I've made this for the past several years, always to rave reviews. I may make this recipe for a veggie dish. I've made it in the past and it is delicious, but it is something that needs to be whipped up right before serving. It's done on the stove, so oven space is not an issue, but it is usually so hectic in the kitchen at that time. If it were up to me, I'd make these (which I make at least once a week), but the oven issue kind of rules that out. I'm trying to avoid Green Bean Casserole. I hate the stuff, but my husband loves it so who knows how that one will turn out. As for dessert, we'll be getting a pumpkin pie from Costco. I make a fantabulous pumpkin pie, but I hate making pie (and it is one.more.thing I'd have to make). Costco's pumpkin pie is better than most and my husband loves it, so there you go. I will, however, will be making Pumpkin Ice Cream Pie, which I'll actually make up today and freeze until the big day. And, as I promised, a recipe. This is for Corn Pudding and it is a staple for Thanksgiving in my family. The first time my husband had it, he fell in love with it. It's pretty simple and it is one of those dishes you just put in the oven with the dressing and what not once the bird comes out. It isn't the fanciest of dishes, but it is yummy! 1. Mix all ingredients EXCEPT the reserved 1/4 cup of saltine crumbs and butter and pour into a buttered casserole dish. 2. Cook for about 35 minutes at 350 degrees. Just before the time is up, melt the butter and combine with the reserved saltine crumbs. 3. When the 35 minutes are up, remove the casserole and sprinkle the crumb mixture over the pudding. Return to the oven for an additional 10-25 minutes. The pudding will be done when the center isn’t sloshing around.